Major US equity indices continue to try to repair the technical damage they sustained in February and March. After a decent rally in the past couple of weeks, risks are rising near term. 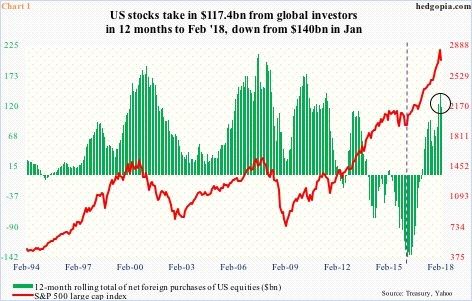 Foreigners sold $1.2 billion in US stocks in February. This was the first month in six they cut back. As a result, on a 12-month rolling total basis, foreign purchases in February were $117.4 billion, down from $140 billion worth in January. Directionally, the green bars and the red line in Chart 1 tend to move together. The latter peaked in January, and has struggled since. In fact, the S&P 500 large cap index (2677.84) dropped all the way to 2532.69 on February 9 before reversing higher. Monday, it rallied 0.8 percent, but sellers showed up on the 50-day. Even if this average gets taken out, major resistance awaits – around 2730, which represents a falling trend line from January 26 when the index rose to an all-time high of 2872.87. Foreigners can play a role as to what happens next. Back in February 2016, they were selling $145.3 billion in US stocks before the green bars bottomed (dashed vertical line). Incidentally, the S&P 500 reached a major bottom in that very month. Thus the question, will the January high equate to a similar milestone? Time will tell. This much we know. Major US equity indices act weak technically. 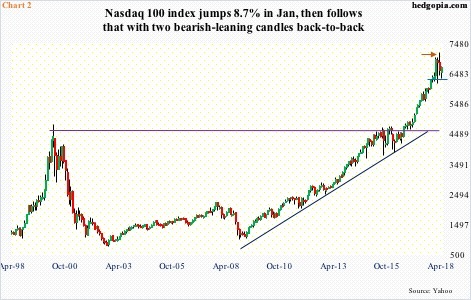 Of the major ones, fatigue is probably most visible in the Nasdaq 100 index (6675.18). Stocks began 2018 with a bang, with the Nasdaq 100 rallying 8.7 percent in January. Then came the sharp selloff early February. Peak to trough, the Nasdaq 100 collapsed 12.2 percent in 11 sessions. The bulls used this as an opportunity to load up, resulting in a hanging man candle in February. This was followed by a new high in March, but the breakout was false, with the month ending with a reversal candle (arrow in Chart 2). Several monthly momentum indicators have turned lower. In the right circumstances for the bears, they can go a lot lower. Thus the significance of 6300, which is about where the 200-day lies.